An Online Blog Dedicated to Hobbyists and Light Industrial Users, and Potential Users, of Desktop 3D Printing and Fabricating Solutions. This blog is dedicated to non-kit 3D printers. So, why am I pointing you to a site called 3D Printer Plans? The name sounds like they are deeply entrenched in the "build experience" but they cover a LOT more than that. One of their interests is in helping first time buyers with selecting the best 3D printer fit for their needs. Because of the technical nature of 3D printing, it can be difficult to know how to get started. And, though there is a lot of information out there on the Internet about 3D printing, little is aimed at the first-time printer user. To help make 3D printing easier to understand - and help you create your first print in less time - the team at 3D Printer Plans have put together a free beginner’s guide to 3D printing. If you’re interested in learning the “how” of 3D printing, then this is an ideal resource for you. At just over 14,000 words long, the guide is comprehensive enough to teach you everything you need to know to get started, but refreshingly free of complicated jargon and highly-technical explanations. From the history of 3D printing, to picking your first printer, through to essential software and maintenance procedures, you’ll learn the important things you need to know in order to get started. By reading 3D Printer Plans’ beginner’s guide, you’ll give yourself an ideal foundation of knowledge to help you make the most of your new hobby or business. The site is quite impressive. So, I think it's well worth the time to explore beyond the guide. Well, DeltaMaker passed its first serious hurdle by meeting and exceeding their KickStarter funding goal of $107,000. With 22 days left to go in their KickStarter campaign, they have already raised... as reported a few minutes ago, $108,559! Congratulations to the DeltaMaker team! One of the things I like best about the DeltaMaker effort is that it is a TEAM endeavor. It's not just a guy working alone. While I have nothing against lone inventors, it takes a lot of different skills to pull off designing and producing a successful product as complex as a 3D printer. Right now, the team is a bit heavy on the technical side of the equation. And, they seem to be pretty astute guys. So, it shouldn't take them long to realize and appreciate that they need expertise on the marketing and sales side of the equation as well. The DeltaMaker isn't a kit that narrowly appeals to hobbyists. It's got real potential to be a mainstream consumer and small business product. It's not enough to create and build a great product. It's also important to grow the company behind it with solid understanding of their target market and the best sales distribution to serve that market. You might think that I'm getting ahead of myself on a startup that hasn't delivered the first unit as yet. For all we know, it could all be just smoke and mirrors. But, I have a gut level feeling about this management group and this particular product. And, I do NOT sense failure on the horizon. My mind works in strange ways. And, for some reason, I cannot get the connection between the Keurig coffeemaker system and the DeltaMaker out of my head. It's hard to believe it now; but, I'm absolutely certain that back in 1990, when the Kuerig was first organized, that the idea of a single cup coffee maker in homes and offices seemed as strange as the idea of a 3D printer does today. They didn't have a KickStarter back then. And, Green Mountain didn't purchase them until 2006. That journey took 16 years! But, what they did have was a fantastic team of designers. And, that is certainly part of their success. But, great design was not all of their success. They eventually came to have, at least in my opinion, a true genius when it comes to consumer marketing. In a long list of people I admire, he is certainly at the top. While I don't know when he originally came on board with Keurig, I am certain that a great deal of Keurig's success is due to the expertise of John Whoriskey, who is the VP & General Manager At Home Division. He has grown the home market business into producing staggeringly successful numbers. I have never met Mr. Whoriskey. But, we have corresponded over the years as we've discussed the success of Keurig's remarkable market growth. And, it's been a joy for me to follow that success. I hope that I can experience that same joy as I watch DeltaMaker grow from a small startup to a wildly successful company bringing the enormous benefits of 3D printing into homes and businesses. Somehow, I think that will happen. I don't expect those that pledged funds to the KickStarter to be disappointed. In fact, I think they will be able to look back and be proud of how brilliant they were at jumping at that opportunity. Every now and then I stumble onto something that completely enthrals me. That happened to me today. I have NO idea how I got there; but, somehow I ended up on the KickStart Page for one of the cleanest and most innovative 3D printer designs that I have come across. Kickstarter seems flooded with new 3D printer entries these days. But, the DeltaMaker is in a class of its own. First, it is NOT a kit. (Otherwise, I probably wouldn't be writing about it.) Secondly, it does not use the traditional four-corner, boxlike X-Y-Z axis controls of virtually all other 3D printers. Instead it uses a 3-point pivot system. While not the first 3D printer of this type, it certainly is the cleanest and most professional looking. Watching it print is poetry in motion! Perhaps it's best to see for yourself. As you can see, it's quite a unique design. It makes you want to go, Why didn't I think of that?" While I have many unanswered questions, like reliability and, of course, actual accuracy over a long period of time, the DeltaMaker looks like a real winner. So, while I'm not going to put my money where my mouth is quite yet (After all I already have some great 3D printers. ), I certainly am going to follow their progress very, very closely. I would love to see DeltaMaker succeed and succeed BIG. Here is the link to the DeltaMaker KickStarter page. Until we see how the production models of DeltaMaker actually perform, there is little more to say. As the old cliche goes, "The proof is in the pudding." and it will be a while before the pudding is served. In the meantime, however, I think all of us can be glad that we have innovators like the DeltaMaker team. Way to go guys! As I learn more, I will keep everyone updated. Like all new ventures, they will face some big challenges whether they limp along or are wildly successful But, I have a feeling this group has the right stuff to meet those challenges head on. And, if they can prove that their design functions at the same level as their "Cool Factor", I'll certainly be cheering them on. While I have not yet been able to see the CubeX in person, I have found some additional information about the specs that may be of interest to those considering it. I think the best way to address this new information is to start with what we DO know and work forward. Obviously, the 3D Touch is a part of the lineage of the CubeX. But, a lot of thought went into designing the CubeX to ensure major improvements for the user. For me, one of the most significant changes is that the CubeX utilizes 1.75mm filament instead of 3mm. I have used both, and absolutely prefer the 1.75 format. The problem I've had with 3mm filament is that as we near the end of the spool, there is a significant amount of filament that is just wound so tightly that it really can become unusable. 1.75mm, like that used in the Cube and CubeX, is much more flexible. So, based on my experience with the Cube, we should be able to avoid wasting as much filament due to tight winding issues. I know that a lot of people are going to take issue with the fact that the CubeX uses proprietary cartridges instead of commonly available open spools. I understand that. Frankly, we all know that ounce for ounce, kilogram for kilogram, we are going to pay a bit more for filament. But, per kilogram costs are not the only factor to consider when assessing value. I live in the Mid-Atlantic and I can tell you from experience that summer's humidity is NOT a trivial issue when open filament sits around for very long. Those of you that have read my Cube blog also know that it has been my experience that it is as easier to find sub-standard filament than premium quality filament. Both of the factors have contributed to some frustrating printing inconsistencies. and clogs in the middle of a print job. One of the reason I appreciate the Cube's cartridge design is that I simply do NOT run into those issues with the Cube. Now, aborted prints might be acceptable for hobbyists. But, this blog seeks to serve those that need a 3D printer to get a job done for income. Time is money. And, frankly, the more professional you are, the more valuable your time. So, it doesn't take many 5 hour print jobs having to be restarted 3 hours into the print run due to humidity or poor quality filament to MORE than offset the differences in cost between spools and cartridges. Remember, I now have two 3D printers... one relying on proprietary cartridges and the other generic spools. And, I have become a believer in the value that cartridges bring to the table in spite of the slightly higher direct costs. I have enough open spools that still have a significant amount of useless filament on them to fully embrace a 1.75mm cartridge. That isn't marketing hype. That is real experience talking. The print heads of the CubeX have been redesigned and, of course, filament is loaded from a cartridge. The combined result is easier material handling. Again, this is a "time is money" issue for busy companies that may have to change materials several times a day. For me, the result is a better multiuser platform where several designers and fabricators need to use the same printer. Like the Cube, the cartridges keep track of available material and alert the user so that a job does not end up being aborted for lack of material. I have not been able to talk directly to the project manager in charge of the software for the CubeX as yet. So, I cannot tell you for sure that we will be able to turn rafts completely off as we can with the Cube. But, since both the Cube and CubeX utilize a special glass printing surface I fully expect that we will finally be able to print without a raft if supports are not needed. I have reason to believe that it is at least on the radar. And, when I finally get to see the CubeX in person, hopefully in early to mid February, it is going to be one of the first things I discuss with them. While the two and three head machines can print soluble rafts and supports, if we can avoid them altogether, as is possible with the Cube, then that is a VERY good thing. Part of my analysis will be to make sure that a not-for-profit organization that works with "at-risk" young people gets the best printer for their project needs. I take that responsibility very seriously because we (I am a volunteer) will have to live with that decision for a long time and there are more than a few good possible choices. I've been a longtime subscriber to Desktop Engineering and it has been my go-to magazine when it comes to keeping up with not only 3D printing; but, fabrication of all types and, in particular, the software to drive it. But, sometimes I miss something that I should not have. Fortunately, I have friends that also read DE and one of them, while doing some research, found this article. 3D Printing On the Cheap by Pamela J. Waterman. Not only is the article an excellent overview of the low cost 3D printers coming into the market. But, they also pointed to this blog and the companion CubifyFans blog as excellent sources of information. I am humbled and pleased. As you can imagine, I am a very happy camper! If you go back to the origins of this blog and my interest in 3D printing, it came directly out of my daughter's career as a ceramics sculptor. The style she had chosen involved an intensely laborious process of building up layers of clay to form a basic organic shape and then carving out intricate patterns. It took weeks and months for each piece. Consider just how long these pieces might have taken. Unfortunately, it took SO long that she ended up having to abandon this particular artistic path. Hopefully I can add... "Until Now!" to the end of that sentence. I may be biased; but, I have always been extremely proud of not only her work; but, how hard she worked at it. But, even so I knew there had to be a better way to turn the images in her head into tangible form and went searching for it. This is when I stumbled on to the potential of 3D printing. It's been a long time. And, I knew that various people were working on it. But, now, through Anne-Pieter Strikwerda's 3dprinting.com blog I have learned that some people with the same dream have worked hard to make it a reality. 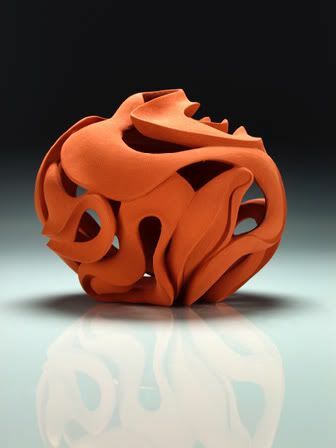 "Unfold, a Belgian Design Studio, has been experimenting with 3D printing ceramics. And with success. For their prints they used a RepRap printer which they modified so it could extrude the ceramic filament. 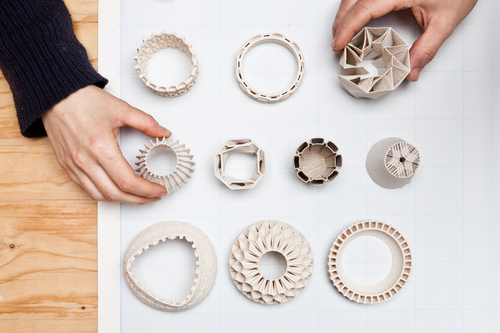 Unfold’s 3d printer for ceramics not only harnesses the potential of new technology and materials but also projects the past history of specific techniques into the future. 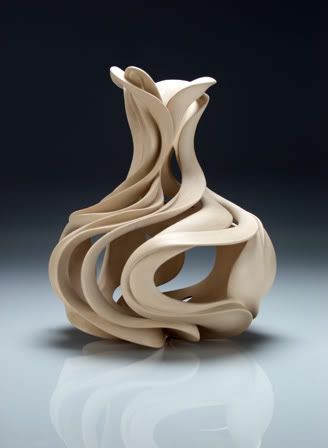 The printer has a great resonance with the way traditional potters handled clay, however because of its ability to produce such fine layers, new forms are possible." Here is also a link directly to Unfold's Blog. The great news for me is that the platform on which their system is based appears to be the RapMan, which I already own. If I step up to the CubeX, this means I might be able to modify the RapMan to work with ceramic for my daughter. And, I would be one VERY happy camper. So, I am very grateful to 3DPrint.Com for reporting on this! THANKS! I will explore the 2nd article in a separate post. CubeX Wins CES 2013 Emerging Technology Award! It was a lot of fun watching the C/Net Best of CES 2013 Awards ceremony live feed. I have no idea when I might be able to see, and possibly test, the CubeX for myself. When I made my first visit to see the Cube just after last year's CES, I traveled to Rock Hill. Since I will be presenting at Hagley Museum, in Wilmington, DE where the Cube team will also be presenting, I expect to see the new Cube there. But, I did not recognize any of the faces of the team that accepted the award for the CubeX. And, since 3D Systems in located in a variety of locations, I have no idea where I might have to travel to be able to take a look at the CubeX and print some test objects. But, it is something I have on my agenda. And, when I do, you can be sure that you will get a full and honest appraisal of how it performs. But, I WILL wait until I know that I am working with a true production model. I want to know what users will experience as they try to use it. In the meantime, let's just appreciate the accomplishments of the CubeX team. Way to go!